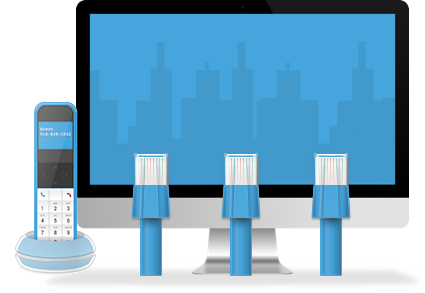 We've got internet calls services known as VoIP which offer you different kind of service as locals and long distance calls. Get our internet calls service with Bravo Telecom and get an enhanced voicemail service, a three-way calling known as a conference call. We've got an unlimited internet service at low price. Find out more about the different kind of technology we offer. Go get a look to our bundle deals . 200 min of long-distance calls per month across Canada and the U.S.
What do you get with 5 Mb/s ? With a speed up to 120Mb/s, Bravo Telecom offers a reliable and efficient service. Don’t worry! With Bravo Telecom, get a great internet experience at very affordable prices and a top-notch wireless connection! Internet powered by robust and efficient equipment! Included in each package, equipment for sale at an affordable price. Enjoy our IP phone for a little extra! Get unlimited local calls and all advanced phone features with our Duo and Bundles packages. SPRING PROMOTION: Free installation and modem rental too! This limited-time promotion applies to new customers who plan to subscribe primarily to some pre-selected hybrid fiber internet, duo, bundle or students services. The discount is already applied on the offers posted on our website. Not valid with any other discount or promotional rate. This offer may end at any time without notice. The spring’s offer includes modem rental for free, and installation fees offered. The promotion also includes a discount up to 30% on your monthly payment on the following offers: internet, Duo, Trio and Students with the following download speeds: 5,15, 20,30 and 60Mb/s. Some conditions may apply. Visit our promotional page for more detail. Internet fiber to your neighborhood, then a powerful cable network from the neighborhood central to your home. You cannot rent the router. Modem rental is free. A deposit of $ 40 will be requested at the time of purchase. The client may bring his/her own router. In case of termination prior to the activation service or during the warranty period of 15 days after installation, all fees will be refunded. In the case where the new client, having chosen the policy of purchasing more than one payment for their starter kit, cancels their service before having made all the payments, this one will be automatically collected the total of the amount due at the time of service cancellation, if the 15-day service guarantee limit is exceeded. If the warranty period – 15 days of service activation – has not been exceeded during the termination of service, Bravo Telecom will retain part of the payments made until the return of the equipment. The customer will have a period of 15 working days to return the equipment, failing which, a complete collection of the remaining sum will be made. The customer who has chosen the starter kit purchase in two (2) or more installments, if they wish, may voluntarily pay all of the remaining sums and thus keep their equipment during the termination of service. The first installment of the starter kit will be automatically withdrawn when ordering. The second installment will be taken on the day that the services are installed. Other starter kit installments will be billed on the same day as the service monthly payment. For the following speeds ( 5M & 10M – 60M & 120M): The first monthly service fees will be withdrawn on the day of your installation. For the following speeds (15M to 30M): Installation fees and modem rental are free. Your monthly payment will be debited from the day of activation of your service. Our unlimited offers are subject to the utilization standards. For more information please refer to our terms and conditions.